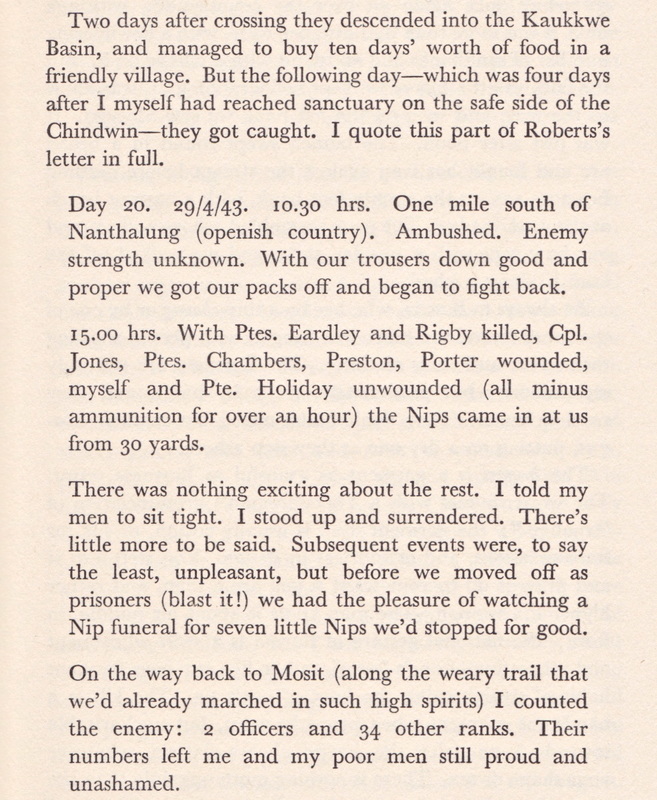 This is a description of Captain Tommy Roberts platoon and their dispersal in April 1943. This presumes that he took with him on dispersal the majority of his machine gunners and mortar section from column 5, as these were the men he commanded on operation Longcloth. Pictured left is Roberts sporting his first Chindit bush hat. (The photograph was taken in India in 1942 and is courtesy of his daughter Patricia). After the battle at Hintha, where column 5 suffered a significant amount of casualties, Fergusson calls dispersal and the men move out in small groups and head for the agreed rendezvous point some 4 miles northwest of the village. Around 120 men finally arrive at this meeting point and begin their journey towards the confluence of the Irrawaddy and Shweli Rivers. After a disastrous crossing over the Shweli a further 40 men are left stranded on a large sandbank in the middle of the river and all become prisoners of war. The remaining soldiers are then broken down into three main groups of 30 or so under the command of Fergusson, Denny Sharp and Tommy Roberts. These three dispersal groups agree to split up on the eastern banks of the Irrawaddy on the 10th April, in an attempt to make their separate ways back to India. The other men of column 5 (who missed the rendezvous after the battle at Hintha), many wounded and by now extremely weak and hungry, struggle up toward the confluence of the Irrawaddy and Shweli Rivers, here by chance they meet the majority of column 7 and the two groups merge. After leaving Fergusson and the other column 5 dispersal groups close to the Irrawaddy, Roberts and his group attempted to cross using small native boats, but only one party succeeded in making the crossing that evening. The remaining men settled down to build rafts from bamboo and other materials available to them in the hope of crossing the river the next day. This was close to the Burmese village of Zinbon, which unfortunately for the group was visited by a Japanese motor boat patrol several times each day. The dispersal group could not all be ferried across in one journey on their makeshift rafts so, Corporal Eland and Privates Blanchard, Cross and Porter volunteered to remain behind and swim across when conditions allowed. “These were all good men, strong swimmers, they remained behind to take their chance with the river later. I remember Eland as tallish with a long chin, Cross was fair haired, Porter tall and also fair, Blanchard as studious and academic in appearance, wearing his Army issue spectacles." The first small group that got over in the native boats included the column cipher officer Bill Edge; with him were Lance Sergeant Edward Gunn, Lance Corporal H. Roberts and Ptes. Albert Blease and J. Lewis. Also with this group were a few Gurkha Riflemen who had become mixed in with column 5 on their journey out from the Irrawaddy. This group moved off into the jungle and headed west toward India. Amazingly Edge was to meet up once more with Bernard Fergusson, he (Edge), Lance Corporal Roberts and the Gurkhas remained with Fergusson for the rest of the trip back to India. “After much searching we found three, small, waterlogged boats. I was sent across at dusk with these boats. The current was very strong and the boats became separated and we were swept downstream. When I reached the west bank, I had only my boatload of two men. It was impossible to communicate with Lieutenant Roberts as the river was three quarters of a mile wide and I had no torch." From one of the other boats mentioned by Lieutenant Edge, Gunn, Lewis and Blease wandered through the jungle making good progress west, but the three became weak with hunger and Blease and Lewis were suffering badly from malaria and dysentery. Sergeant Gunn refusing to leave any of his comrades behind entered a village in search of food; in the end all three were captured by the Japanese. The remainder of Roberts’s group did get over eventually, but saw nothing of the above-mentioned men until the fortunate survivors met up once more in Rangoon Jail. 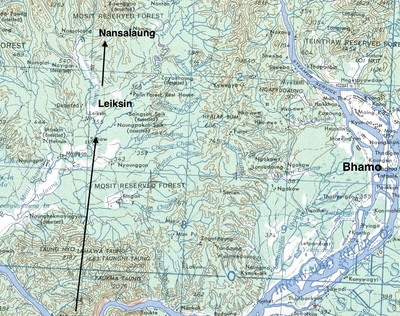 Two days later the main group were captured in the Kaukkwe Basin near Nanthalung. After being hounded by the Japanese on 27/04/1943, and after exhausting what was left of their ammunition, Roberts unashamedly surrendered late afternoon on the 29th. The men named with him at this point were: Privates Rigby and Eardley, who had both been killed in the struggle for freedom. Corporal Jones and Ptes. Chambers, Preston and Porter all of whom had been wounded. While Roberts himself and Private Holiday had come through the ordeal unhurt. "On the 29th April we were in openish country just south of Nanthalung. It was here that we were ambushed, enemy strength unknown. With our trousers down good and proper we got our packs off and began to fight back. By 15.00 hours, Eardley and Rigby had been killed and Jones, Chambers, Preston and Porter all wounded. Only Holiday and myself remained unwounded, the Nips came in at us from 30 yards. There was nothing exciting about the rest. I told my men to sit tight. I stood up and surrendered. There’s little more to be said. Subsequent events were, to say the least, unpleasant and we moved off as prisoners (blast it!)." Lieutenant Tommy Crawford Roberts who began the war a Sergeant in the Kings (and whose father was RSM in the regiment before him) was taken eventually to Rangoon Jail, but was flown out to Singapore for further interrogation by the Kempai-tai, he gave precious little intelligence away to his captors. Thomas survived the war to become a school teacher in Lancashire. 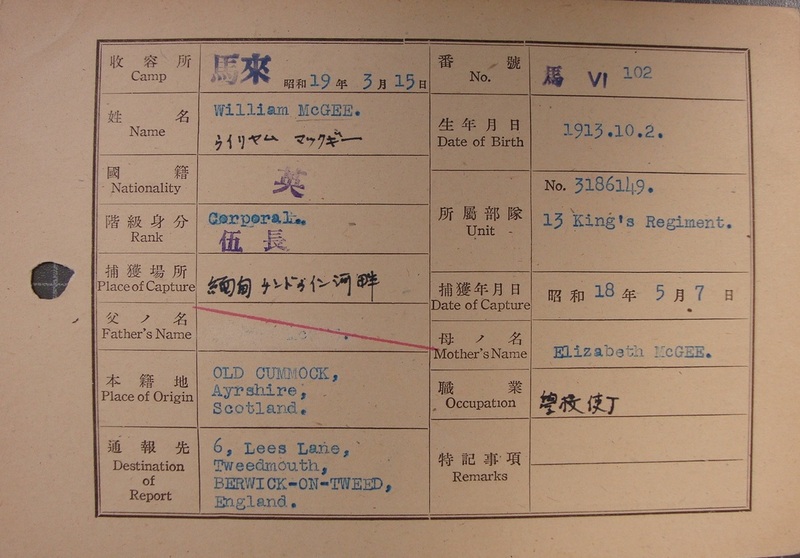 Seen left, is Roberts' Japanese index card, which differs slightly from the other Chindit POW's, due to his removal from Rangoon Jail and subsequent interrogation at the Changi Camp in Singapore. Lance Corporal 3779423 H. Roberts made it out to India with Fergusson having been in the same boat as Lieutenant Edge. Corporal 3779326 George Henry Jones survived his time in Rangoon Jail and travelled home to the UK, he died in 2003. Corporal 3596547 Richard Miller Eland, a mechanic by trade, was pronounced as missing after the ill fated Irrawaddy crossing, but turned up in Rangoon Jail a few days after the other men. He was liberated in early May 1945. From a translation of his POW index card (seen in the next gallery), he was captured on the 24th April 1943 on the banks of the Irrawaddy, near the village of Zinbon. Friday 25th June 1943- I remember how Eland worked wonders at Zinbon, building a raft when all of my men were weak and tired (as was he) from lack of food. His example was a source of inspiration to the others and certainly he deserves the Military Medal or perhaps a Mention in Despatches. ​The following men are reported missing in the various theatres of war. Corporal Richard Eland, husband of Mrs. M. Eland of 103 Cleveland Street, Birkenhead is missing in the Indian theatre of war. He was with the first Wingate Expedition in Burma. Hi, I did a search on line just looking for general information about Burma and was so happy to see my Grandfather Richard (Dicky) Miller Eland mentioned on your website. Sadly, my grandfather died in 1990. I am at my Mum's house on the Wirral today, she was his daughter and we are just trying to recall the stories he told us about his time as a prisoner of war. The website has given my family information they were not aware of. I will speak with my Uncle as he has all the memorabilia and Granddad's Burma Star medal. I need to look on a larger screen to see if I can identify him in any of your images. This is wonderful work, thank you so much for putting this together. Thank you for your recent email contact via my website. It is wonderful to hear from you. I have a few documents in regards to your grandfather, one of which you will have seen on the page about Tommy Roberts' platoon. It would be fantastic to have a photograph of Richard for my records and any memories/stories you have about him; with these I could enlarge his story on the Tommy Roberts page. Thanks for your reply. I will be at my Mum's next week so will dig out some pictures there. Granddad was a fabulous character and didn't have a wrinkle in sight and a full head of hair. It amazed me how well he aged despite his experience as a POW. He was still doing the monkey bars in the local park at 70 years old. Will be in touch soon and its amazing what you've done. I feel so proud of my grandfather and all the men he was with. It certainly is a big story to tell, I'd never heard the soldiers referred to as Chindits before. Pte. 3772689 Alfred Rigby was killed in action on 27th April 1943 defending his dispersal party. From the lists kept by Captain Roberts it is now known that Alfred was buried near where he fell, in the village of Leisic. 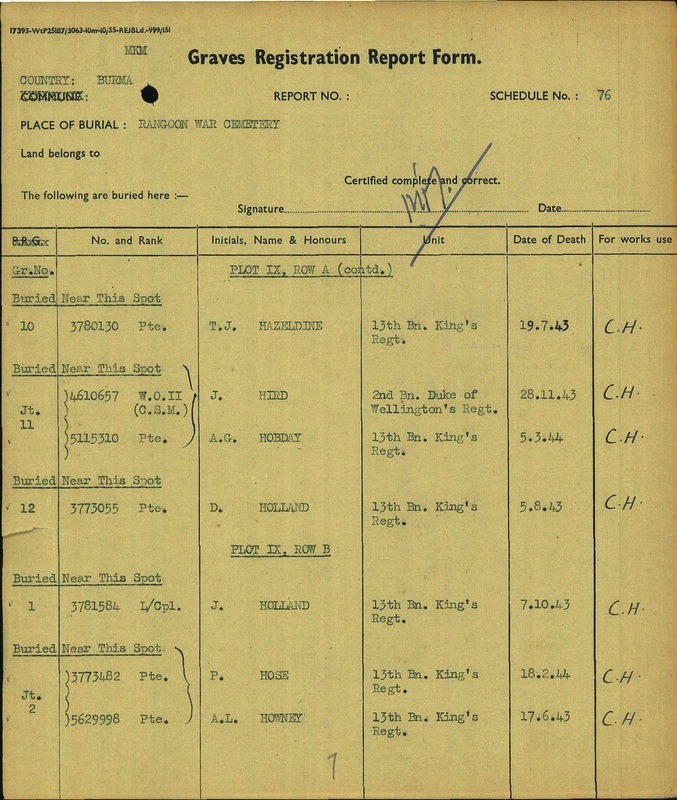 The War Office and War Graves Registration Unit were still looking for information about Alfred's last known whereabouts as late as July 1952. 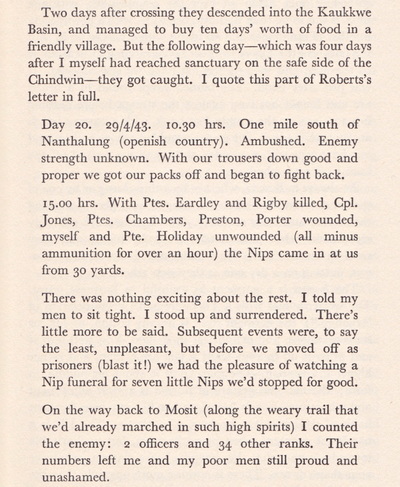 In a letter dated , 7th July 1952, they asked Captain Tommy Roberts what he could remember about Pte. Rigby's death and subsequent burial north of the Irrawaddy on the 27th April 1943. Presumably, Captain Roberts would have also received a similar correspondence in relation to Pte. Eardley. Seen above are two more POW index cards for men of Roberts's platoon. They both show the Japanese characters for Rangoon Jail (top left hand corner). The POW number for each man is in the top right hand corner, notice how close Jones and Eland's numbers are, unsurprisingly as they were both captured around the same time. 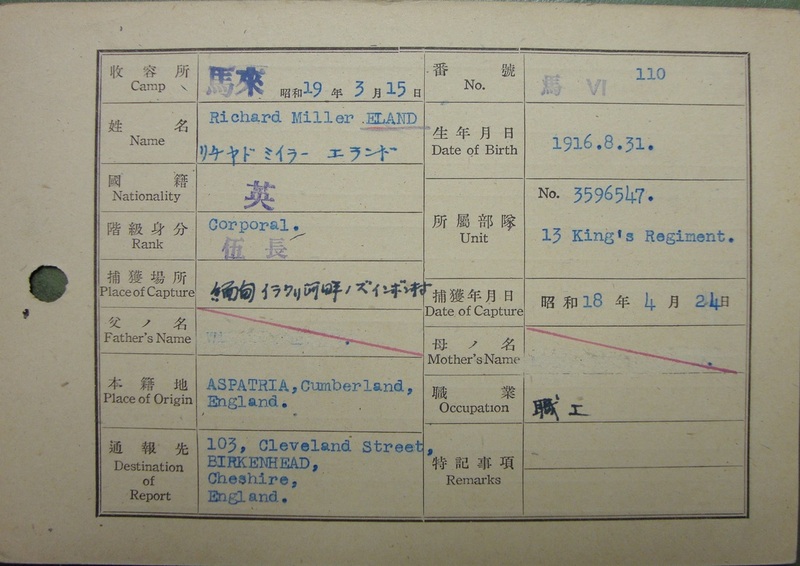 In fact, the date of capture shows that Richard Eland was captured just three days before Jones on the 24th April 1943. Pte. 4198452 Joseph Fitzpatrick was captured on the 26th April 1943 and sadly died inside Rangoon Jail from the effects of beri beri and dysentery on 21st October 1944, he had been Captain Tommy Roberts groom during his time in Column 5. He lived at 62 Bread Riding Lane, Appley Bridge in Wigan. "My father spoke very warmly of all his men, particularly Leslie Chambers, whom Dad said was probably the best soldier he had ever known and deserved the Military Medal. I hope one day to trace any living relatives of him and the other men and let them know what my father, their commanding officer, thought about them. Dad may have tried to do this himself after the war, but they were difficult times and communication was not as simple as it is today." Mrs. Chambers of 23 Milroy Street, Liverpool 7, has received notification that her husband, Leslie, aged 29, is missing. An old boy of Heygreen Road Council School, he has been stationed in India for the past 16 months. About six weeks after entering Burma most of my chaps were lousy with lice. This state of affairs worsened after capture, especially on the rail journey from Maymyo down to Rangoon which was a nightmare. There were twenty-seven prisoners plus three Japanese guards to each cattle truck, some of the men were wounded and movement was impossible, the three nights on the train were nightmarish. Sleepy, dirty, haggard, unkempt and hungry, I could feel the lice running all over my body. Never in all my life had I been so low in spirit and so wretched. And yet it was my duty to cheer up and care for the men and they were swell, joking through the worst of it, stoically taking cuffs and kicks from the Japanese. One of my platoon, Pte. Chambers had a nasty wound in the back of his thigh which was now maggot-ridden through lack of medical attention. He was conspicuous by his ready smile and an occasional joke and this had been his character throughout the whole campaign and he deserves the Military Medal, which I must try to get him. Pte. 3650504 F. Preston was captured on 29/04 with Roberts’s dispersal party, he survived Rangoon to go home. Pte. 3779395 J. Porter was liberated from Rangoon Jail in early May 1945. He returned to England on 25/09/1945 and was admitted into the Pinder Field Hospital, Wakefield, presumably still suffering from the effects of his time as a POW. Pte. Holiday, originally nothing was known or could be found in relation to this man. However, please see the update in regards to Pte. Holiday at the foot of this page. Pte. 3780060 A. Cross survived Rangoon and was liberated in early May 1945. Pte. 3779408 Frank Blanchard, liberated from Rangoon in early May 1945, returned to 23 Kirkdale Vale, Kirkdale, Liverpool. 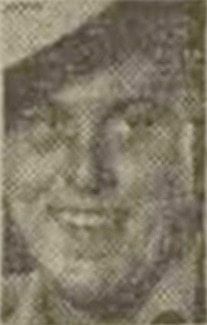 Corporal 3778140 Albert Blease died in Block 6 Rangoon Jail on 27/01/44 suffering from beri beri, his POW number was 400; he was buried in English Cantonment Cemetery. Albert was a machine gunner within the Support platoon. Pte. 3656416 Benjamin Blackburn was left in the jungle close to the village of Thabyala, suffering from both dysentery and malnutrition. This occurred south of the Irrawaddy and just before Tommy Roberts and the remainder of his platoon crossed the river two miles east of Zinbon. Benjamin died in Block 6 of Rangoon Jail on 26th December 1943, with the disease beri beri being recorded as his cause of death, his POW number was 395. Pte. 5623744 Albert Ernest Bayliss was captured alongside Benjamin Blackburn at Thabyala, also suffering from dysentery and malnutrition. He died inside Block 6 of Rangoon Jail on 26th February 1944 and his POW number was 460. Albert was a muleteer in the platoon, his charge probably carried one of the heavier weapons from the unit's armoury such as the mortar. Lance Sergeant 3780107 Edward George Gunn was promoted twice during Operation Longcloth, he refused to leave Ptes. Blease and Lewis on dispersal, a courageous act that probably cost him his life. He died from malaria combined with dysentery on 31/05/43 having just arrived at Rangoon Jail. 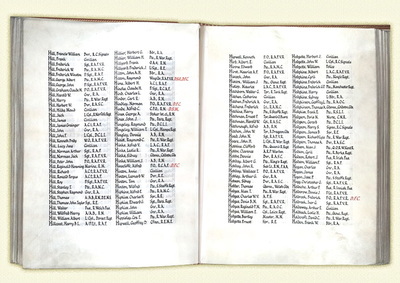 It is now known from the records kept by Captain Roberts, that Edward was buried in St. Mary's Church Cemetery, Rangoon. This was the burial location for some of the men who perished shortly after their journey down from the Maymyo concentration camp. Gunn was a young lad who had started the expedition as a Lance Corporal, and had shown himself to be so good that I advanced him first to full Corporal and then to Lance Sergeant, both times replacing a man who had failed under the more rigorous conditions of the field. Earlier in the expedition he had become separated from Denny Sharp's party and had joined up with a body of British troops with a wireless set and two or three officers, who were setting out for India. On his retun to 5 Column, he informed Tommy Roberts: I didn't think it was a healthy sort of party, sir. Not according to my idea in any case. They had plenty of food, five times as much as us I reckon; not that they'd give us any. But what they hadn't got was water discipline. Would you believe it, sir, they had a pull at their water-bottles just whenever they felt like it and nobody checked them. Anyway, I said to the lads, Come on boys, this lot's doomed. I've got a map and a compass and I reckon we will find a boat all right if we search long enough. I have often taken a chance of promoting a man out of his turn, and I have sometimes been disappointed in him; but it would take a good many disappointments to counterbalance the satisfaction I felt when I heard this about Gunn, a lad who can't have been more than twenty-two, and who was younger than most of the men he commanded and over whom he had such influence. Pte. 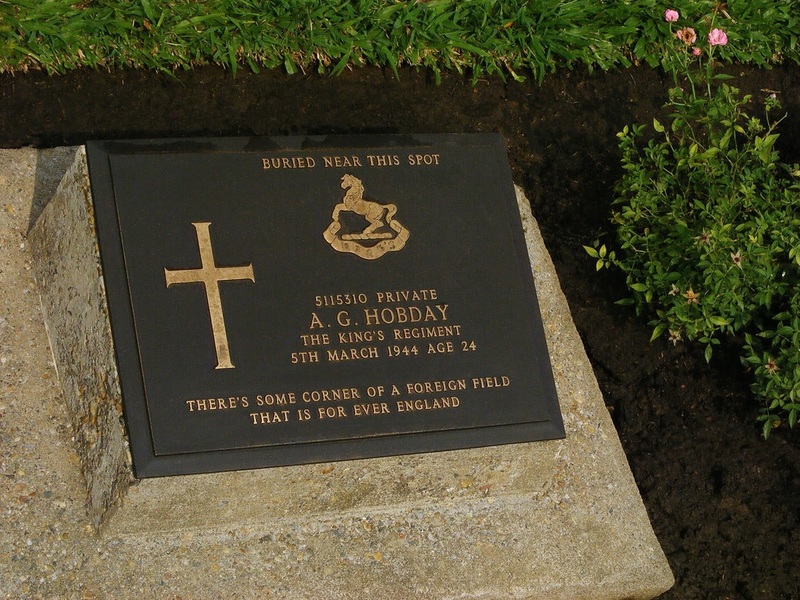 5115810 Albert George Hobday was captured on 29/04/1943 and died in Block 6 Rangoon Jail, his POW number was 421, and he was buried in the English Cantonment Cemetery. I now know that Albert ran one of the Vickers machine guns in the Support platoon. NB. Please see the update, dated 29/03/2016 towards the foot of this page. Pte. 4199413 J. E. Lewis was captured with Sergeant Gunn and Private Blease; he survived Rangoon and was liberated in early May 1945. He passed away in 2004. Pte. Lewis was part of a Vickers machine gun team in the Support platoon. Pte. 5116945 Edwin Thomas Poulter was captured on 29/04 with Roberts, he died in Block 6 Rangoon Jail on 23/02/44, and his POW number was 565. These men, having lost touch with Captain Roberts during the action (Bonchaung), went back to where the column had previously camped, just off the Tatlwin road, taking a wounded Gurkha with them. They hoped to find the main body of the column still there. They waited for an hour in which time the Gurkha died. Had they waited a short while longer, then they would have met up once more with Roberts, who went back to find them. If they had of rejoined the platoon it is highly likely they would have never returned home to the UK. McNulty and Scott had only two compasses with them but no maps. They did however have the benefit of a single Burma Rifle other rank, who was vital in securing food on the journey back to India. 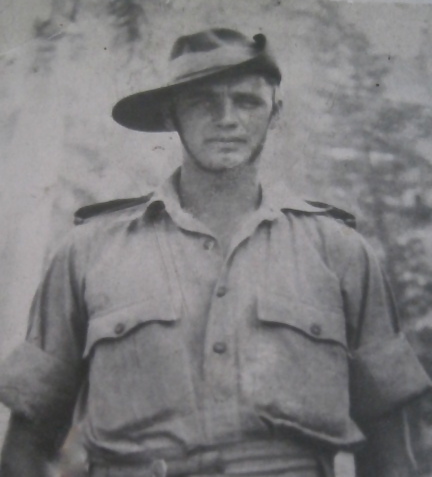 The Rifleman had been with Lieutenant Pam Heald's party earlier in the operation, but had lost contact with his original platoon, sadly the soldier was killed after a short exchange with a Japanese patrol, agonisingly just a few short miles from the Chindwin River. Below are the grave memorial plaques at Rangoon War Cemetery for Edward Gunn and Albert Blease, both lost after crossing the Irrawaddy in one of the small native boats. 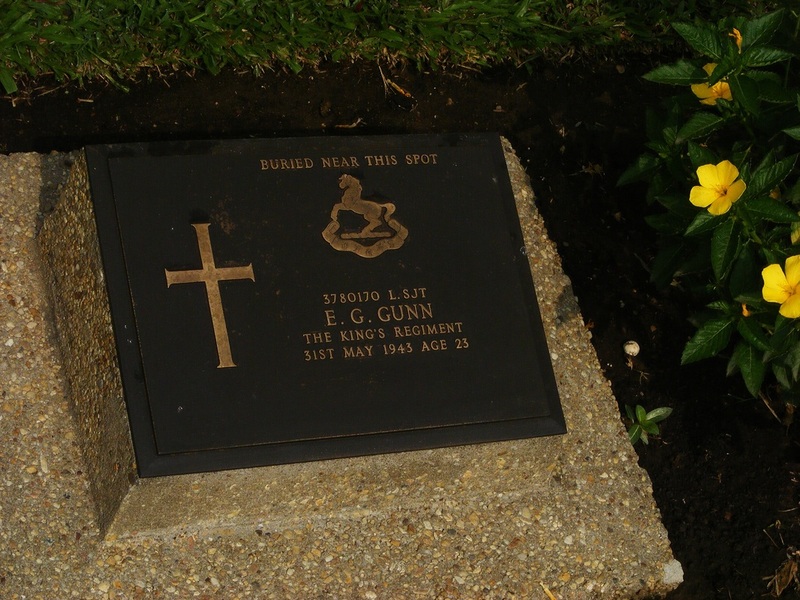 It was stated that Gunn had the opportunity to escape becoming a prisoner, but refused to leave his Chindit pals. Ironically, his two comrades faired better in Rangoon Jail than he did, Blease surviving 6 months before succumbing to disease and Lewis being liberated in May 1945. 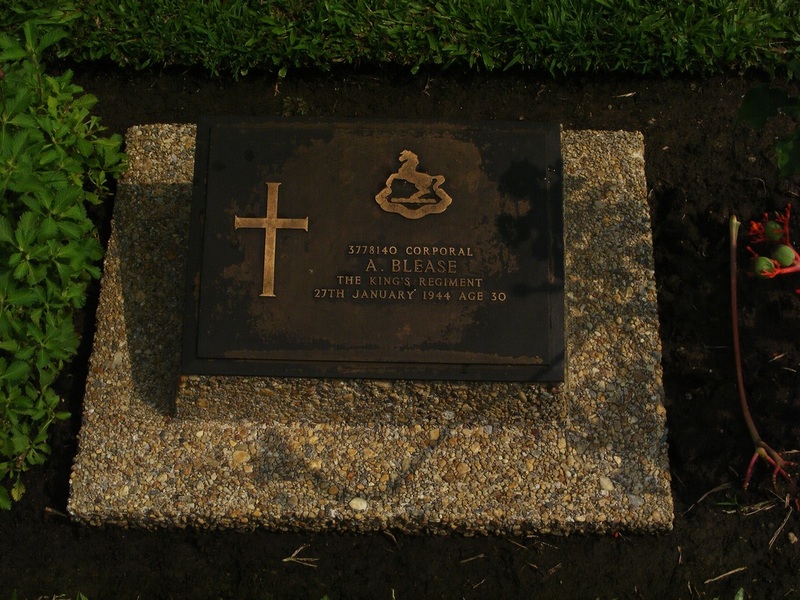 Edward's plaque includes the inscription 'Buried Near this spot', this is in reference to a group of 67 men who were buried soon after arriving in Rangoon Jail, having died one after the other from around late May 1943. Their original burials were performed in such haste that no precise order was recorded, hence the combined inscription. My Grandfather was also one of these men, dying not long after Sergeant Gunn. (Photos courtesy of Tony B nt872b(at)hotmail.com). As a wonderful footnote to this story, in January 2012 I received an email from the daughter of Tommy Roberts. After several email exchanges Patricia has provided me with some wonderful photographs of her father's time in India and Burma. The image seen below is Tom's platoon from the 13th Kings aboard the troopship 'Oronsay' during their voyage to India in early 1942. This group of men were his responsibility during the early months in India at the Gough Barracks in Secunderabad. It is so rare to see such unit photographs within the Longcloth family, especially featuring Other ranks, it does make me wonder how many of the men mentioned in the above story sit or stand in this photograph. My very great thanks go to Patricia and her family for the incredible help and additional information about her father and his time in Burma and beyond. Pte. 5627180 Harry Jack Myhill formerly of the Devonshire Regiment. This soldier was captured on the 1st April 1943 on a large sandbank in the middle of the Shweli River. He died in Block 6 of Rangoon Jail on the 1st December 1943, suffering with the disease beri beri. 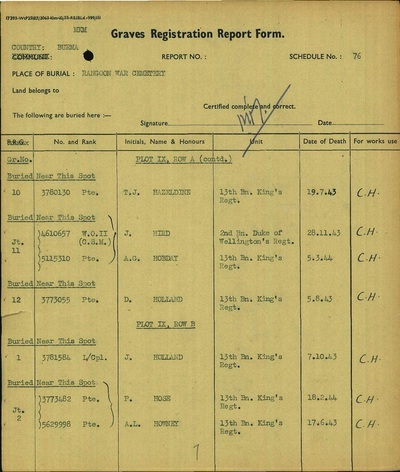 Harry was issued with the POW number 361 and was buried in grave 221 at the Cantonment Cemetery. Pte. J. Myhill was my batman and groom. He was recorded as missing, killed most likely alongside 47 other men at the Shweli River. His wife's name was Edith and she lives at 4 Wenvoe Avenue, Bexley Heath in Kent. Pte. 5116650 Thomas C. Swann. From Liverpool, Thomas was lost from the line of march after column 5's engagement at Hintha. He was captured on 10/04/43 and sadly lost his life to beri beri in Rangoon Jail. New information confirms his placement in the platoon as a muleteer. Pte. 5116731 Herbert Yeomans. From Birmingham, Herbert was separated from his unit immediately after the Hintha engagement and captured on the 1st April 1943. He died in Rangoon Jail from the ravages of beri beri, his POW number was 321. I now know that he formed part of a Vickers machine gun team in the Support platoon. Pte. 5116732 William Yates. 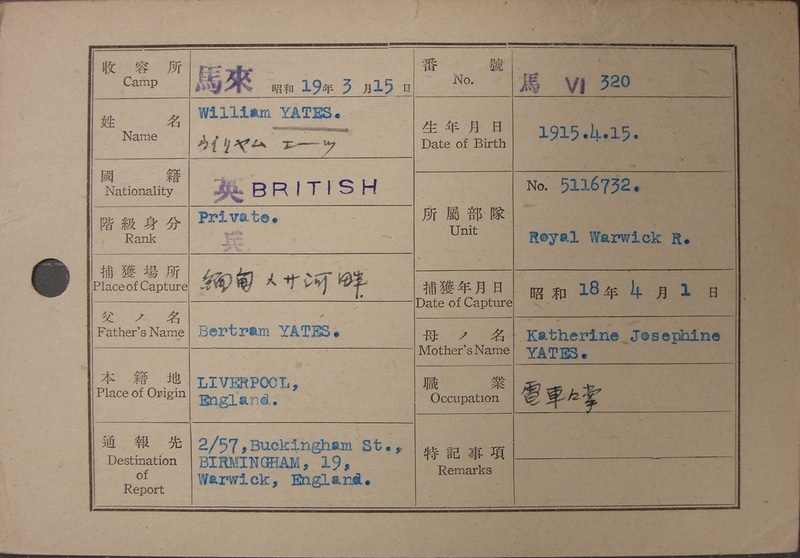 Formerly from Liverpool, William was originally enlisted into the Warwickshire Regiment (as were Swann and Yeomans) before joining the 13th Kings in India. He was also part of one of the Vickers units in the platoon. He was also taken prisoner after the engagement at Hintha, but survived Rangoon Jail to come home. His POW number was 320, this makes me confident he and Herbert Yeomans were almost certainly captured together. Corporal 3186149 William McGee. 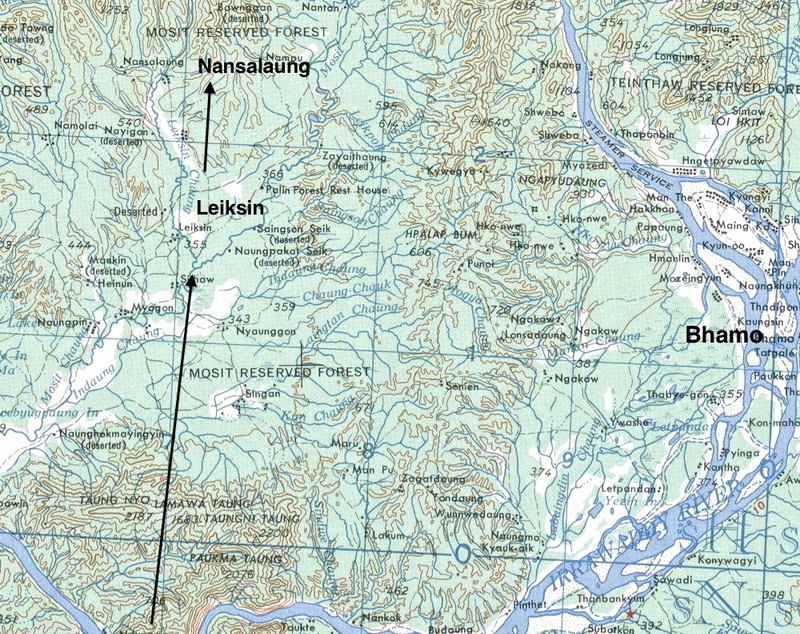 From Ayrshire in Scotland, William became separated along with a large group of men from column 5 around the confluence of the Shweli and Irrawaddy Rivers. He joined up with a column 7 dispersal party led by Lieutenant Campbell-Paterson, but was lost from the line of march on 24/04/1943. He was captured on the 7th of May and taken to Rangoon Jail. His POW number was 102 and he survived his time in captivity and returned to the UK. William was a muleteer in the Support platoon during operation Longcloth and had been involved in an act of great bravery earlier in the expedition. Here is a quote from the book Wild Green Earth (Bernard Fergusson’s account of his second march into Burma in 1944) referring to McGee’s bravery in returning to Htantabin village to collect up the Burma Rifle section and lead them back to the main column’s position. 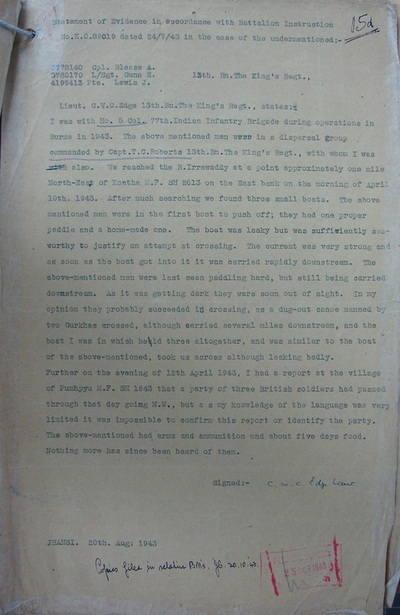 After the action on March 6th at Bonchaung Bernard Fergusson needed to make arrangements for the wounded men to be left in a friendly village, this was to ensure that their immediate medical needs were met and as far as the villagers could manage to keep the men from falling into Japanese hands. “I had several men wounded whom I had to leave, and I wanted to get hold of some Burma Riflemen to travel back to the spot where I had left them, here to induce the local villagers to take them into their care. It was getting dark, and I knew that five miles along a certain track there should be a section of Burrifs (Burma Riflemen). I asked for a volunteer to get on a horse, ride out along the track, which none of us knew, and try and locate this section. We were just about to blow a bridge on the railway; we had already been in action that day in the neighbourhood; another column was making trouble a few miles to the south; and all the Japs in the area were on the 'qui vive'. It was a job I would have hated myself; but Corporal McGee volunteered to go, mounted a horse and rode off into the darkness. He found the Burrif section, and returned with Lance-Naik Ba U and two riflemen who had been back to the scene of our fight only to find the Japs in possession. I remember thinking as McGee rode off, that I was witnessing a brave act, undertaken in cold blood and loneliness. Later in the campaign both McGee and Ba U became missing; Ba U escaped from Japanese hands in 1944, McGee was found in Rangoon in 1945. I submitted both names for the Military Medal, I know McGee got his and I hope Ba U was also lucky". Seen below are the Japanese Index cards for all of the recent additions to the Support platoon's numbers. 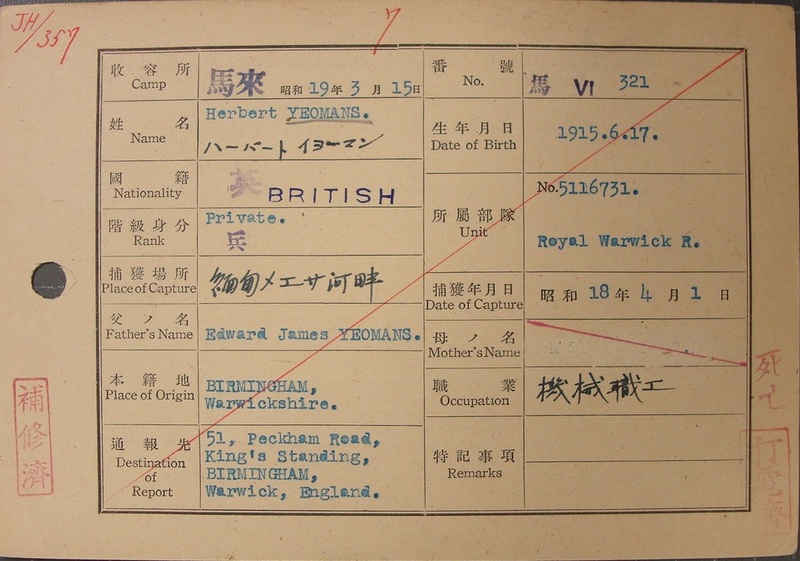 The diagonal red line on Thomas Swann's and Herbert Yeomans card, simply means they had died whilst a prisoner of war. Please click on the images to enlarge. Joseph Edward Lewis, India 1942. I have read with great interest the story of Captain Tommy Roberts and dispersal group at the Irrawaddy crossing. Mentioned in the action is my father Private J. E. Lewis, he once told me that he was a non-swimmer and was not looking forward to the crossing at all. He never forgot the day he was captured and always remembered his two mates Lance Sergeant Teddy Gunn and Private Albert Blease. All three of them were betrayed to the Japanese after entering a village trying to get food. I have some photos of my Dad from his time in India, perhaps they could be placed into your Gallery for soldiers from Column 5. I also have some memories of stories which my father told to me about his time in Rangoon Jail, if you would like me to relate them to you, then I would be happy to do so. 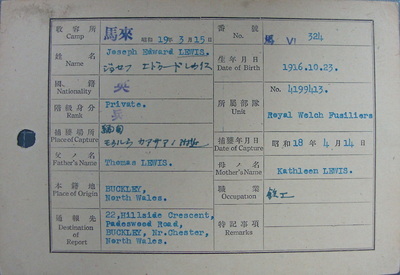 Joseph Lewis was the son of Thomas and Kathleen Lewis from Buckley in North Wales and originally a soldier with the Royal Welch Fusiliers. A small draft (25-30 men) from the RWF's had joined Chindit training at the Saugor Camp in late September 1942. These men were dispersed amongst the various Chindit columns with Joseph being posted to Bernard Fergusson's Column 5. As mentioned already, Pte. Lewis was captured along with his two comrades, Albert Blease and Edward Gunn. 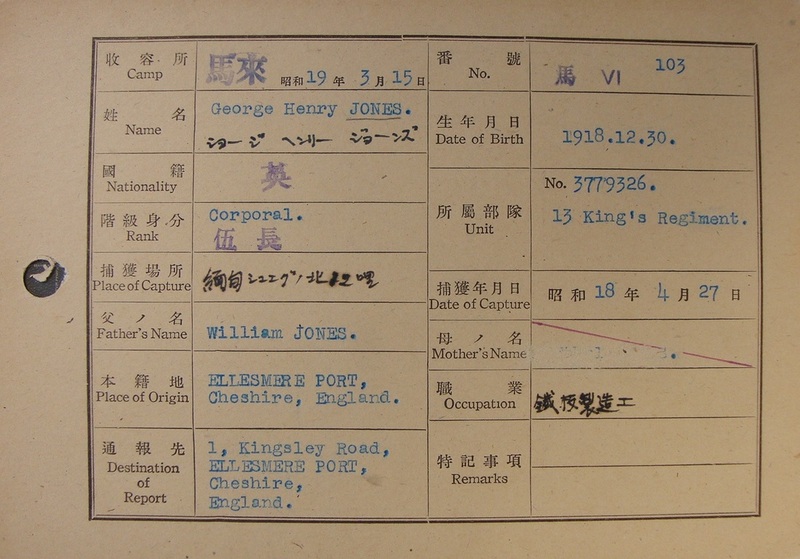 According to Joseph's prisoner of war index card he was captured on the 14th April 1943. Eventually all the Chindit prisoners were taken down to Rangoon Jail where they were placed into Block 6 of the jail. 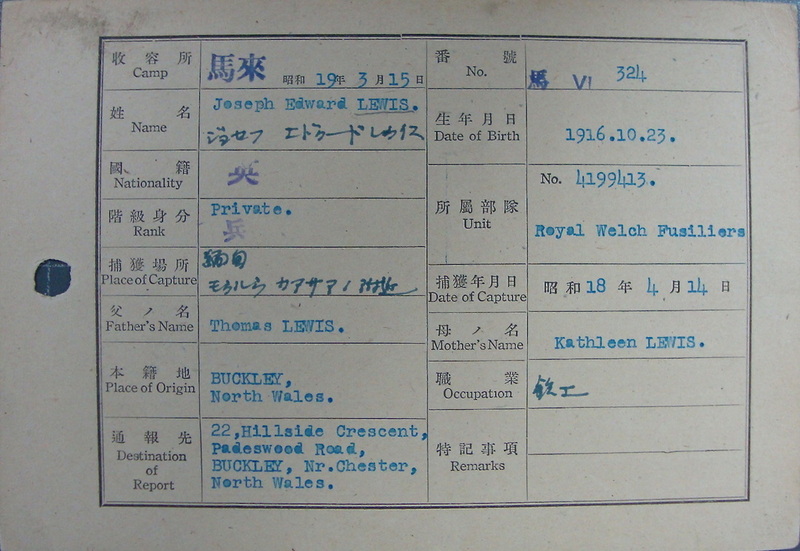 Joseph's POW number was 324, which he was forced to call out in Japanese at all the prison tenkos or roll calls. Pte. Lewis spent just over two years as a prisoner of war, he was liberated in late April 1945 at a village close to the Burmese town of Pegu. For more information about Rangoon Jail and the men from Operation Longcloth who became prisoners of war, please follow the link below. Seen below is one of the photographs that Peter kindly sent over to me in 2012. 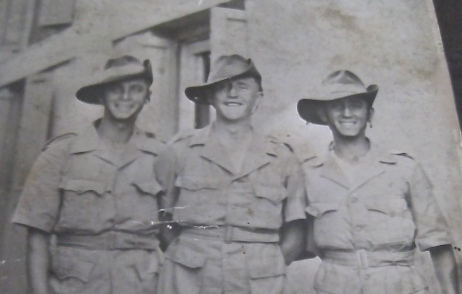 It shows his father (pictured left as we look) and two of his mates and was taken in India a few weeks before they went in to Burma. I must confess that it has crossed my mind whether the other men shown might be Teddy Gunn and Albert Blease, we will probably never know? Also shown below is Joseph Lewis's POW index card, displaying amongst other information, his POW number, date of capture and next of kin details. The other document in the gallery is the full witness statement given by Lieutenant William Edge in regard to the last known whereabouts of Joseph and his two friends in April 1943. Please click on any image to bring it forward on the page. I would like to take this opportunity to thank Peter Lewis and his family for their help in bringing this story to these pages. It was great to see the photo of Lance Sergeant Edward Gunn in the Column 5 photos. He was captured along with my father, Joseph Edward Lewis and Albert Blease on the 14th April 1943. Sadly, only my Dad survived Rangoon Gaol, but he never forgot both of them. Also, I now believe the photograph of my Dad with his two mates (shown in the gallery above) which I sent you a few years ago, shows I think Albert Blease and in the centre Tommy Ginger Byrne. 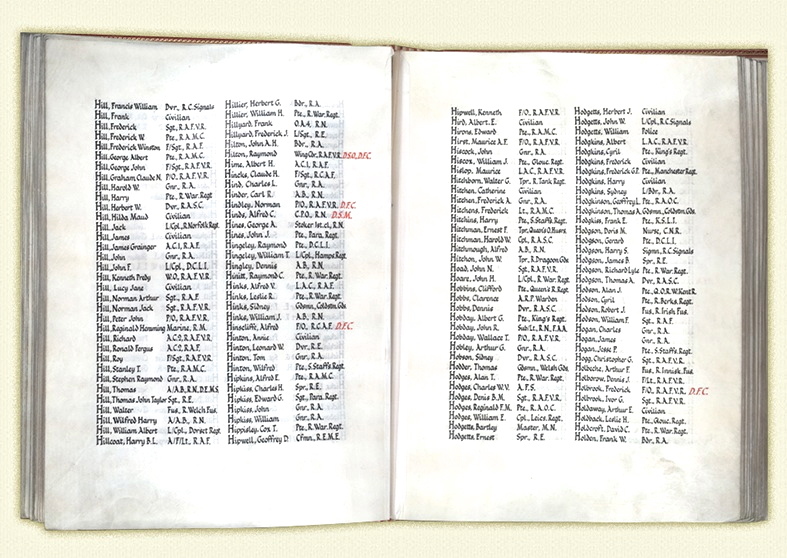 When I first began my research into the men of the 13th Battalion, the King's Liverpool Regiment, my intention was simply to collate a nominal roll of all the men who served with the unit during Operation Longcloth. With that in mind, I scoured all available sources of potential information; finding names in books, diaries, Army files and of course, most sadly of all casualty rolls. Most men fell into fairly orderly categories; those that were killed in action or went missing, those who survived the expedition and returned to India and those who were captured by the Japanese and held as prisoners of war. One or two Kingsmen however, have always eluded my scrutiny and have stood out as unaccountable, with no further information available. Pte. Holiday of 5 Column was one such soldier. As mentioned in the above account, devoted to the men from Tommy Roberts' Platoon, Pte. Holiday was involved in the desperate struggle against the Japanese on the 29th April 1943, the day that the majority of platoon lost either their lives or their liberty. According to the book 'Return to Burma' written in 1962 by 5 Column's commander, Major Bernard Fergusson, a letter sent to him by Tommy Roberts after the war, described Pte. Holiday as the only soldier left unwounded during the firefight with the Japanese which led to the eventual surrender of the platoon close to the village of Nanthalung. It has always then, been somewhat of a mystery that Holiday never featured in any casualty listing or POW rolls and was not mentioned in any of the writings concerning the Chindits of Rangoon Jail. Steve, there is something I have meaning to tell you for some time, it concerns my Dad's dispersal party at the point that Major Fergusson split the remaining men into three groups on the 9th April 1943, in order to try to get everyone back over the Irrawaddy. 1. In the opening pages of my father's POW Diary, written on 23/6/43, he writes about the Japanese ambush of his men: "Two days marching north of the defile, to the area of Leisic (Nansalung) where we were ambushed by a Force of about 40 IJA." Dad then describes how they got their packs off and began to fight back. There were eight of them, Privates Rigby, Eardley, Hobday, Porter, Preston, Chambers and Corporal Jones and of course, my father, Tommy Roberts. Two or three hours after the fight began, their ammo ran out and then there was silence for a while. Then the Japanese came at them from 30 yards away with fixed bayonets. Dad told his men to keep down, and he got up, walked forward and surrendered. 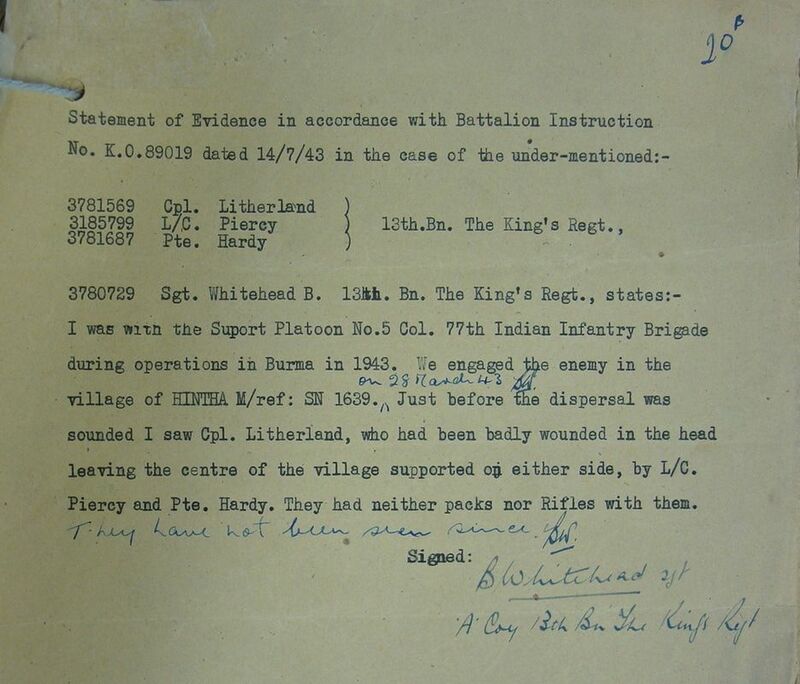 Privates Rigby and Eardley had been killed during the exchange of fire and were buried by the Burmese of Leisic, almost literally where they fell, as were the seven Japanese soldiers also killed. Private Chambers had received a nasty bullet wound in his thigh and Corporal Jones was also wounded in the thigh, though not as badly as Leslie Chambers. Privates Preston and Porter had minor flesh wounds, while Dad and Private Hobday were left unwounded. Dad then went on to relate what happened to himself and the other surviving men in the ensuing weeks, before they ended up three weeks or so later in Rangoon Jail: "removed, securely bound with ropes, firstly to Mosit Chaung, then Moda, Indaw, Katha and south to Maymyo. Then the hellish three night journey in the cattle truck to Rangoon, where we arrived on about 19th or 20th May. 2. This also fits in perfectly with stuff you sent me from the National Archives, in which Lt. Bill Edge, giving a report of the last time he had seen Tommy and his comrades, lists the men still with Dad on the east bank of the Irrawaddy. Hobday is clearly listed, Army number the lot, but there is no mention of any soldier called Holiday. 3. So where does the idea of a Private Holiday come from? Well, I can now tell you that precisely, because it was a misreading of my father's handwriting in his letter of April 1946 to Bernard Fergusson. I was able to obtain a very clear copy of that letter, and another written to Bernard Fergusson by Dad, from November 1960. My father's hand-writing was very beautiful and consistent, but as with all of us, he had his own particular idiosyncrasies of style. I can see most clearly and without any doubt that Dad, describing the ambush to his Commanding Officer, writes that Private Hobday was with him and survived the ambush unwounded, to be taken prisoner there and then, with Dad and the others. However, Dad didn't close up a small letter 'b', which he wrote quite widely and I can therefore understand that to Bernard Fergusson, it must have looked like the letter 'L' suggesting the name Holiday. Hence, in his book, 'Return to Burma', where Fergusson quotes considerably from my father's account of the ambush, comes the writing of Pte. Holiday and so the myth was born. Meanwhile, the truth of the matter was, he was referring to Private Hobday. And so here, some 54 years after the event, we have the answer to the mystery of Pte. Holiday of 5 Column. I'd like to congratulate Patricia for her excellent detective work in unearthing the true identity of the soldier in question. Sadly, Pte. Hobday did not survive his time as a prisoner or war inside Rangoon Jail. Albert George Hobday was the son of Mr. and Mrs. George Douglas Hobday and husband of Ethel May Hobday, from Carbrook in Sheffield. He perished in Block 6 of Rangoon Jail on the 5th March 1944 and was originally buried at the English Cantonment Cemetery located close to the Royal Lakes in the eastern sector of the city. After the war was over, The Imperial Graves Commission moved all the British burials from the Cantonment Cemetery, over to the newly constructed Rangoon War Cemetery. Albert now lies here, sharing Grave 9.A.11 with CSM Joseph Hird of the Duke of Wellington Regiment. 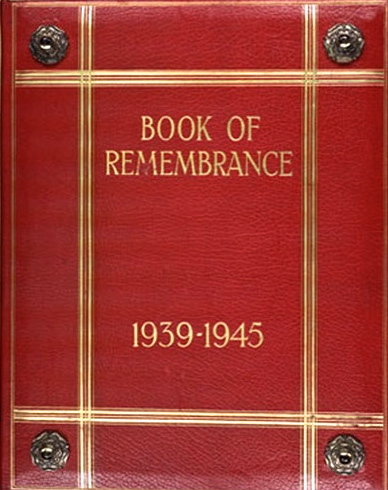 Albert George Hobday is listed within the pages of the Birmingham Book of Remembrance, located at the Hall of Memory in Broad Street, Birmingham. It is possible that Albert is also remembered closer to home in Sheffield, but he is most likely included in the Birmingham Book of Remembrance, because of his service with the Royal Warwickshire Regiment in WW2, prior to his transfer to the 13th King's in September 1942. Seen below is a gallery of images in relation to Albert Hobday and his war time pathway. Please click on any image to bring it forward on the page. I was with the Support Platoon in No.5 Column, 77th Indian Infantry Brigade during the operations in Burma in 1943. We engaged the enemy in the village of Hintha, map reference: SN 1639 on the 28th March 1943. Just before the dispersal was sounded, I saw Cpl. Litherland, who had been badly wounded in the head leaving the centre of the village supported on either side by L/Cpl. Piercy and Pte. Hardy. They had neither packs nor rifles with them. They have not been seen since. Sgt. 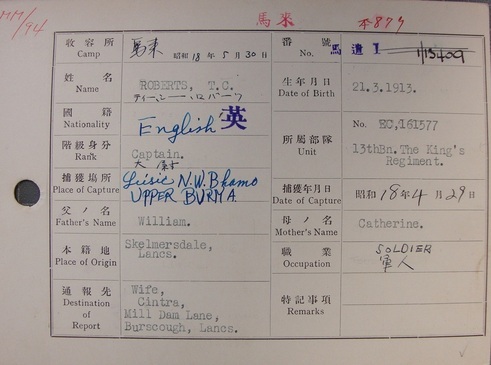 B. Whitehead's original witness statement, given on the 14th July 1943, after his successful return from Burma. 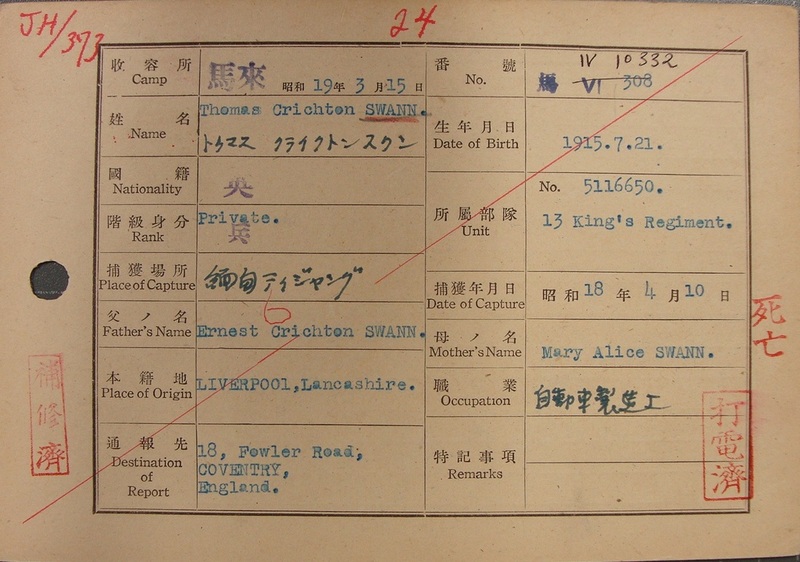 Reported missing more than two years ago, official information has now been received by the parents of Lance Sergeant Edward G. Gunn, King's Regiment, aged 25 of 43 Cromford Road, Huyton, that he died on May 23rd 1943 in Burma while a prisoner of war in Japanese hands. Before joining the Army he was employed by Soden's Furriers of Church Street, Liverpool. His wife is currently serving in the A.T.S. 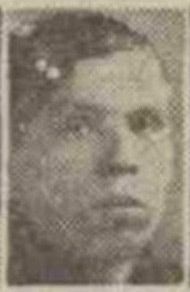 Mrs. C. Blackburn of 8 Exley Street, Liverpool 6, has been informed that her husband, Private Benjamin Blackburn, aged 34, the King's Regiment, died whilst a prisoner in Japanese hands in Burma on December 26th 1943. Private Benjamin was reported missing on the 10th April 1943. A former pupil of St. Michael's School, he joined the Army at the outbreak of the war and was at Dunkirk before going to Burma three and a half years ago. Pte. Bert Yeomans, Wingate's Follies, missing Burma 1943. With a quiet smile you went away, but wherever you are it's your birthday today. From brother Bill, Ciss and Nephews. Bert Yeomans, Wingate's Follies, died POW Camp in Rangoon, June 8th 1944. Birthday memories of a brother that time can never efface. Brothers, Bill, Harry, Leslie, Dad, sister-in-law Ciss, Evelyn, and nephews, Ray, Bill and Michael. Daughter, Patricia Ireland faithfully presents her father's genuine and unique diary, secretly written when a prisoner of war of the Japanese at Changi in Singapore. The diary, written in tiny writing on exercise book paper was turned into an audio recording by Tommy Roberts in 1986. Helped by these recordings, Patricia has transcribed the diary and produced a valuable and historic record for all to read. This additional material is offered by Patricia Ireland, Tommy Robert’s daughter, as Volume 2 for ‘Roll On! 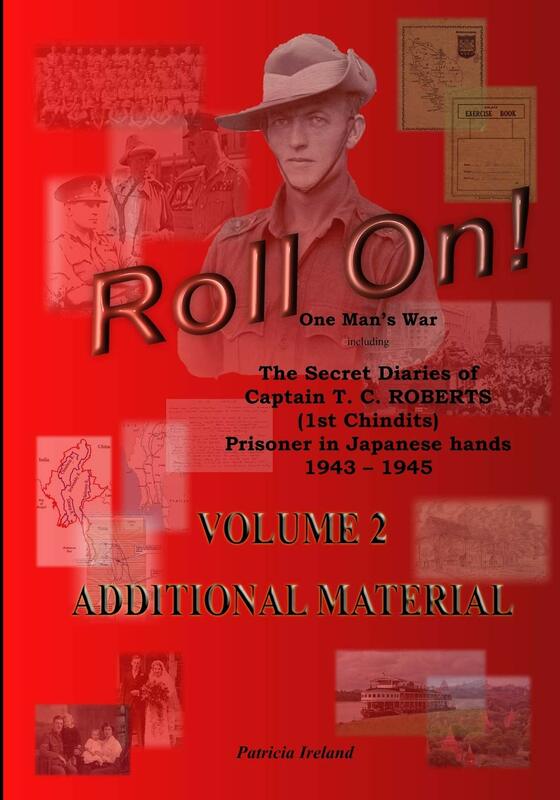 One Man’s War, including The Secret Diaries of Captain T. C. Roberts (1st Chindits) Prisoner in Japanese hands 1943 – 1945 (Volume 1). ​After a sad childhood, Tommy Roberts joined the Liverpool King's Regiment and served in India, where for seven years this new life of friendship, discipline and education suited him well. On his return to England and civilian life, he quickly fell in love and he and his wife Edith were married in June 1939. However, war was of course imminent. Tommy was quickly recalled to the Reserve and by August 1939 he had volunteered as a regular soldier. There followed a year as Instructor in Drill and Weapons Training at Burscough where, in September 1940, he and Ede welcomed their first baby son. With war now raging, Tommy felt duty bound to return to active service. After a year in Coastal and Home Defence the 13th Battalion King's Liverpool Regiment were sent to India. Three months later Orde Wingate asked for volunteers for his 77th Indian Infantry Brigade which was to fight the Japanese behind enemy lines in Burma. Tommy volunteered and commenced a gruelling training program to prepare for war against the jungle, disease and a ruthless enemy. "Sir, I've got more holes in me than a bloody colander." After which the poor man fell back and died. ​"He is with his men now, in Burma. I just know he is." Copyright © Steve Fogden and Patricia Ireland 2011.